In this latest Blog Post, Dr Johanne Devlin Trew, from Ulster University & the Arts and Humanities Research Council (AHRC) Funded Living Legacies World War One Engagement Centre, talks all things ‘Republican Crafts’. On Wednesday March 14, 2018, a community conference and exhibition entitled Irish Republican Prison Crafts: Making Memory and Legacy was held at Belfast’s historical Crumlin Road Gaol. It showcased the Heritage Lottery funded project of Coiste na nIarchimí [Republican ex-prisoners organisation], supported by Living Legacies, Ulster University and The Open University. The goal of the project was to create a virtual archive of conflict-related Republican prison crafts that are in the possession of prisoner families and to capture the stories surrounding these objects of memory. The project took as a model the virtual archive developed by Living Legacies to record WW1 material sourced from the general public. A number of events this June in Belfast will be encouraging the public to engage with their local WW1 history. The events are part of the nationwide Connected Communities Festival. The walking tour will take place in and around the Falls Road, West Belfast, an area rich in contested cultural heritage and with strong community interest in WW1. This venue has been chosen given its immediate proximity to the areas of interest on the walking tour. The tour is built around original data gathered by Prof. Richard Grayson on the origins of the local men that served in the FWW. This event is open to the public and is a cross-community event, we are hoping to encourage members of the Nationalist Community to participate and engage with their WW1 heritage. Cultúrlann McAdam Ó Fiaich website – Cultúrlann produces a vibrant Arts Programme that promotes Irish language and culture while creating an attractive meeting place for tourists and locals alike. A review of Professor Richard Grayson’s book “Belfast Boys” can be found here. This venue has been chosen given its unique collection of WW1 materials, staff expertise and knowledge. In addition NMNI is a partner of the Living Legacies Engagement Centre. The event will feature a guided tour of the Home Rule to Partition section of the Modern History Gallery and will cover events from 1912-1922. There will then be a break for refreshments and this will be followed by an interactive handling workshop involving FWW artefacts. The main benefit to the attendee is an improved understanding of the past, including a broader knowledge of the nuances and complexities of the war. More information on the National Museums of Northern Ireland can be found on their website. More information on the Reminiscence Network Northern Ireland can be found on their website. This event involves both the launch of a new FWW mural and a piece of interactive drama/performance from ‘Medal in the Draw’ by Dr. Brenda Winter-Palmer – LL, QUB. The event will take place in Tigers Bay, North Belfast on the 25th June, provisionally held. Tiger’s Bay is traditionally a strongly loyalist area of Belfast with a high degree of deprivation and strong community interest. The mural reflects a range of perspectives on the war, including women’s role on the Home Front, shipyard strikes and soldiers employed to make crosses to mark the graves of the men who died. The plays script is used as a stimulus for the audience’s questions and the actors then engage with the audience in character. The venue was dictated by the mural location, which is of itself the product of one year’s community research. The event is open to the public and is a cross-community event. The event will be publicised through all partners (see links). More information on arts for all can be found on their website. More information on ‘The Medal in the Drawer’ can be found here. The Living Legacies 1914-1918 World War One Engagement Centre launched this week in Belfast. One of five UK-wide centres funded by the AHRC to connect academic and public histories of the First World War, the centre is a collaboration between Queen’s University Belfast, University of Ulster and National Museums Northern Ireland. At the launch event both Vice Chancellors warmly welcomed the initiative and the collaboration, as did the NMNI’s Director Tim Cooke, with Professor Richard Grayson of Goldsmiths, University of London, giving a lecture in which he drew on his own family history to explore aspects of the history of the First World War as it impacted on Ireland. It provided both an act of commemoration and an important reminder of the intimate links between the personal and the political, the past and the present, connections which the Centre will itself be exploring as it seeks to bring the academic and the public together over the coming months and years. 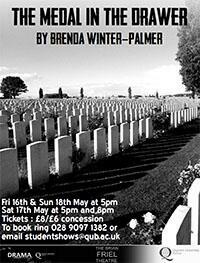 Click here to read more about the play and the family history behind it in the Belfast Telegraph.